Thinking of adding stone tile flooring to your new home or remodeling project? It’s important to first consider where you will be using stone tile and what type of finish and characteristics you are looking for. The focus of this article is to give you a better understanding of the common types of stone and finishes and their characteristics. We will also talk about stone sealers and enhancers. The main types of stone we carry for tile include Travertine, Granite, Marble, Onyx, Quartzite, Sandstone, and Limestone. Granite is formed by intense heat and pressure giving it a very hard, non-porous surface and is not damaged by common household kitchen acids such as citrus juice, vinegar, and sodas. It is known for a crystalline appearance which may be fused with quartz, feldspar, and mica. 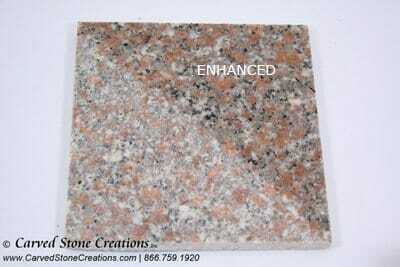 Granite is an ideal stone for countertop and flooring application. 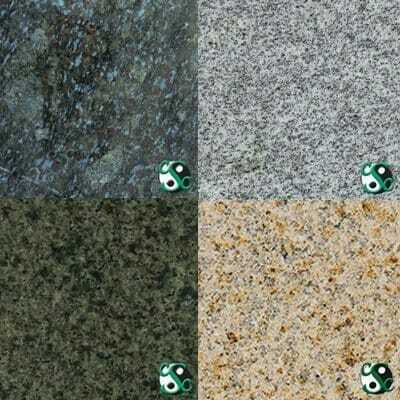 Granite also resists most scratches and shows no damage from heat such as placing hot pots and pans on it. However, it can still be stained by oils like olive and vegetable oil. 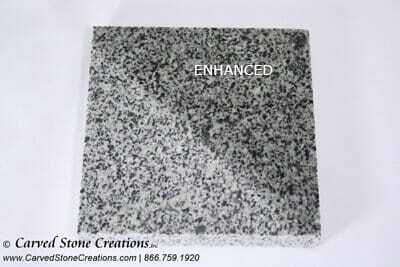 You can also get more information about granite fountains. Marble is formed from limestone or dolomite that have been formed by great heat and pressure over time into a crystalline structure. 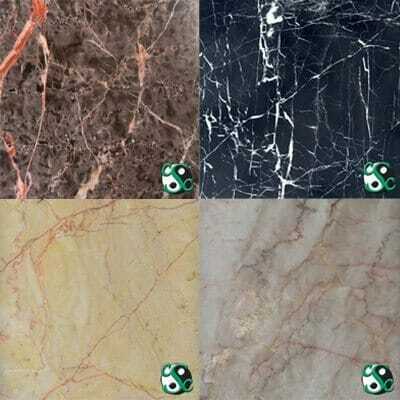 Marble is known for its beautiful colors, bands, streaks, and clouds. Marble is a great stone for bathrooms, backsplashes, and lower traffic areas. Marble is a softer and more porous stone, so it can be susceptible to staining and etching by acidic liquids. Onyx is a form of quartz crystals fused together in nature to form solid stone and is most often found in caves. 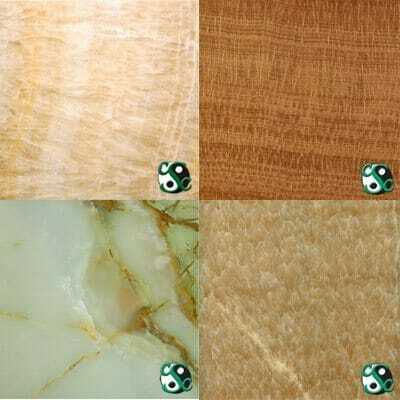 The semi-translucent nature of onyx and the vivid colored banding and crystalline nature of it make it a prized stone well suited for accenting other types of tile in flooring. 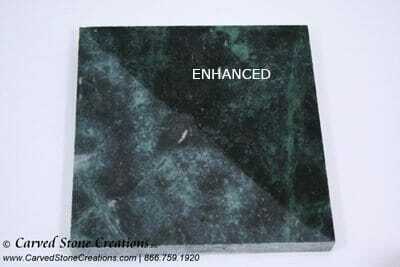 Onyx is a softer more porous stone and can be susceptible to staining. Travertine is a rock typically formed by hot springs which dissolve the underlying limestone that eventually hardens into stone again and as a result has many small air pockets and pits in its surface. This gives the stone a unique, rustic old world appearance that has been treasured as a building stone as far back as the Romans. 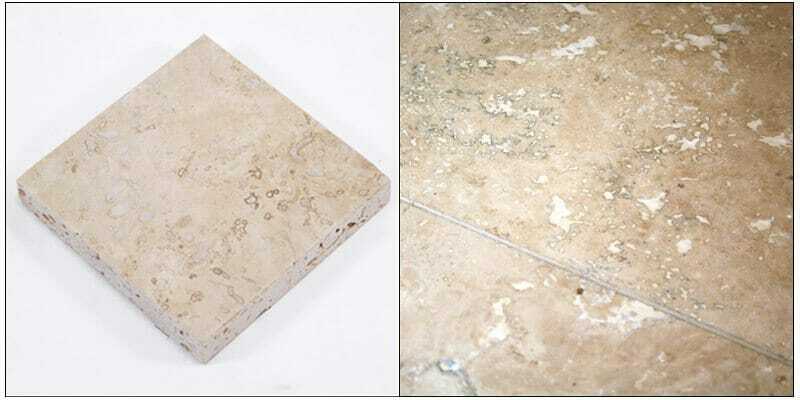 Travertine is a popular choice for foyer and bathroom flooring, walls, and bathroom vanities. Travertine is a porous stone and can be more susceptible to staining then Granite or Marbles and should be protected with a sealer. 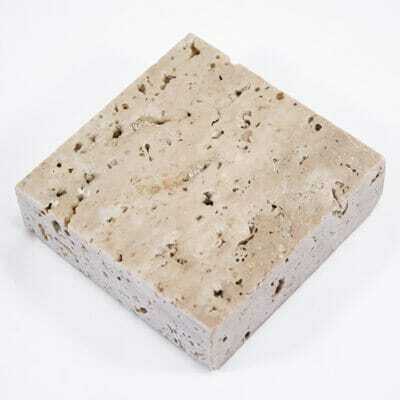 Limestone is a sedimentary stone formed by build up of calcium and organic matter which hardened over time. Many limestones exhibit different colors and impurities such as clay, sand, organic materials, and even fossils trapped within them. Limestone tile is popular for bathrooms, living rooms, and foyers and like marble is susceptible to staining and should be avoided in kitchens. Like Limestone, Sandstone is a sedimentary rock formed by the buildup of sand, clay, and other organic materials and has a variety of earthtone shades which can exhibit fantastic bands of color; some of which even resemble woodgrains. Sandstone is a characteristically hard textured stone great for outdoor surfaces but can be worn down by sand and other abrasives. 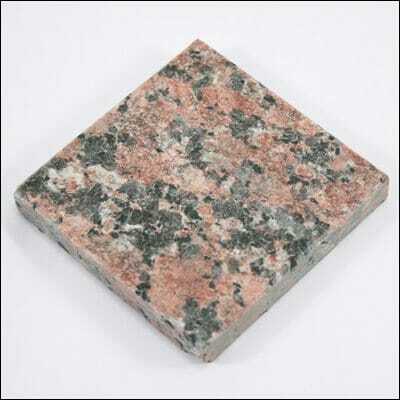 Quartzite is a combination of sandstone and quartz crystals formed together by intense heat and pressure. Quartzite has a grained texture and can contain bands of quartz crystals. 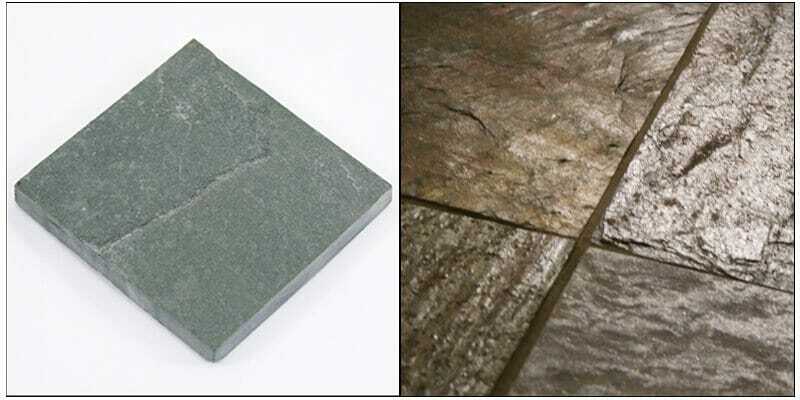 Its natural texture which is similar to sandstone when given a natural cleft finish makes it an idea stone for outdoor flooring or other areas with water exposure. Slate is a sedimentary stone composed of shale and quartz which naturally forms into thin horizontal layers. By expertly striking the rock to break it and separate the layers, quarries can create generally smooth and uniquely textured tiles from the stone. The rustic natural look of the stone makes it a favorite for outdoor tile and paver applications, and the textured surface also makes it will suited for areas such as pool decks, kitchens, or entryways where water may create a slip hazard. 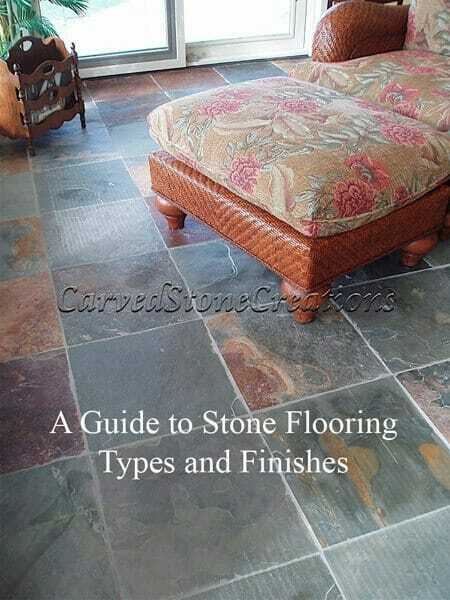 Let’s take a look at the most common stone finish types that are available on the market. A Honed stone tile has an evenly cut, uniform thickness, similar to that of a planed piece of wood and has a smooth finish which should be free from any cutting or sanding marks. A honed stone tile will typically not have any evidence of a gloss finish. Instead it will be naturally matte or flat finish. Honed stone tiles will typically have uniform, straight cut or beveled edges and can be installed with tight grout joints. Perhaps more then any other finish, we associate stone tile flooring with having a gloss polished finish. Polishing brings out the best of the color and depth of the veining or crystalline appearance of the stone tile, but can still be susceptible to staining or etching depending on the type of stone. Not all stone tile is dense or hard enough to achieve a good polished finish. 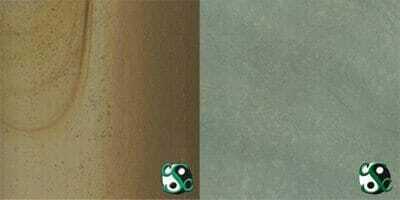 Granites and Marbles are most commonly polished over other stones such as Travertine or Limestone. Its important to consider where you are placing polished tile in your home, and how much foot traffic it may get. Polished stone tile can have a slippery surface that may pose a greater risk for slip and fall accidents in your home. The picture above shows two samples of Opal Brown Marble side by side. The tile on the left has been polished, while the tile on the right is honed. Notice how much more vibrant the polished tile is, especially how the white and lighter tan mineral deposits come to life compared to the honed sample. 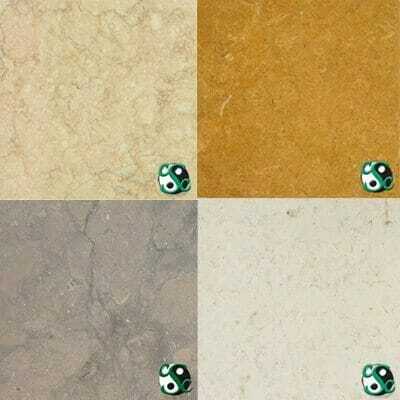 This type of tile finish pertains mostly to Travertine Tile. 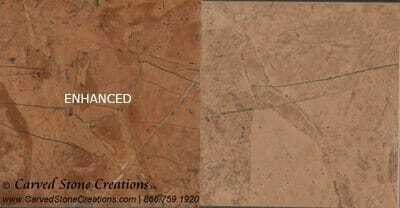 Travertine is a naturally porous type of limestone that is formed by the heat and pressure of natural hot springs. This gives the stone a unique porous texture that can have several air pockets within the stone. 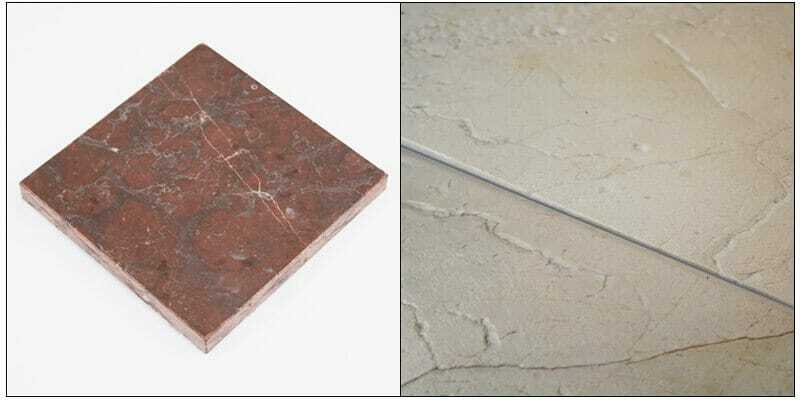 Honed and unfilled stone tile is basically a Travertine tile cut to a uniform thickness with an evenly cut top, but it is often covered in small pits and air pockets. Unfilled travertine has a beautiful look, but can be more of a chore to clean as water, dirt, and other debris can be caught in the pitted surface of the stone. 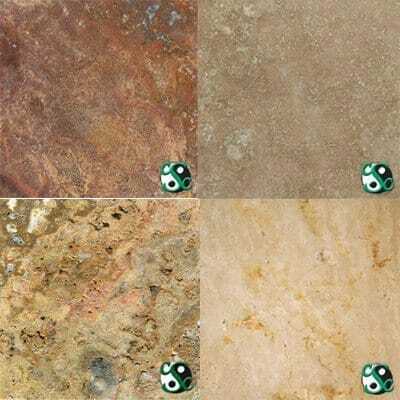 Honed and filled stone tile is basically a honed tile which has all of the pits and other surface imperfections filled with a grout that is of similar color to the natural stone. This gives the tile a completely smooth surface and makes it easier to clean and maintain then an unfilled tile. As you can guess, this stone tile has a hand chipped edge which gives it a rustic, aged look while the surface face remains smooth. Also note that the sample on the right is a honed and unfilled travertine and you can see the air pockets on the surface as well. Chipped tile will require wide grout application. Brushed stone tile is a unique finish that retains the feel of a natural un-machined finish but is actually textured with a specialized wire brush tool. The surface finish is similar to a leather like feel with a smooth but ridged surface. Brushed finishes can be applied to a wide variety of stone including Travertine, Marble, Limestone, and Granite. 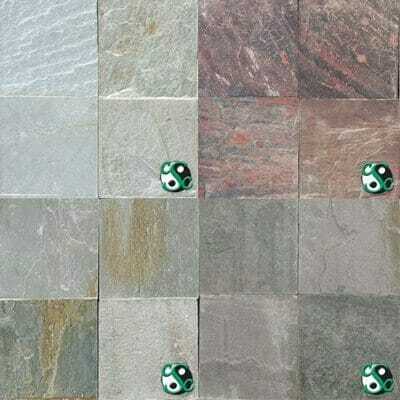 As the name implies, tumbled stone tiles are literally tumbled in a drum or other enclosure along with small stones or other abrasives to give the stone a smoothed finish that often has slightly chipped and rounded corners and edges and an almost sandblasted like appearance. 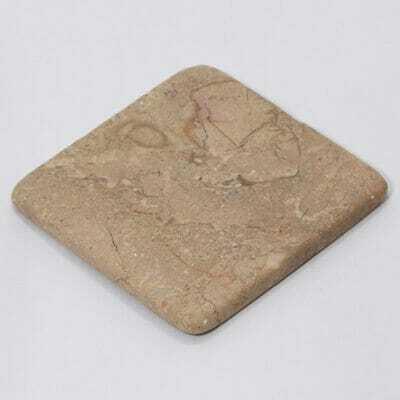 Basically, a tumbled stone tile will resemble a weather worn stone. Due to the potential for breakage during the tumbling process its uncommon to find tumbled stone tiles in sizes over 18 x 18 or 12 x 12. 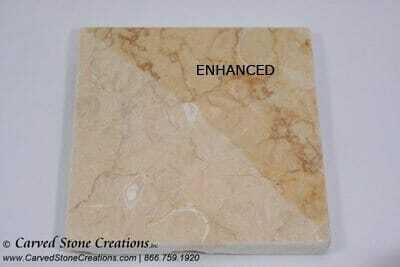 Tumbled stone tiles in smaller sizes are popular for mosaics or back splashes. Tumbled stone tile requires a wide grout seam. Natural Cleft is a surface finish created by splitting the stone instead of mechanically cutting it. Stones like Slate, Quartzite, and Sandstone are formed in layers and create unique textured faces when the stone is split. 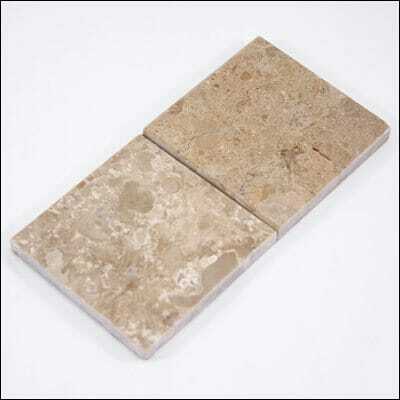 Natural Cleft stone tiles tend to have an uneven textured surface but are still usable for flooring. Natural Cleft tile is very slip resistant, making it a great choice for kitchens, bathrooms, outdoor patios and walkways, and around pools. Flamed stone tile is basically tile that has been heated by a blowtorch to cause a slight melting of the crystals in the stone. 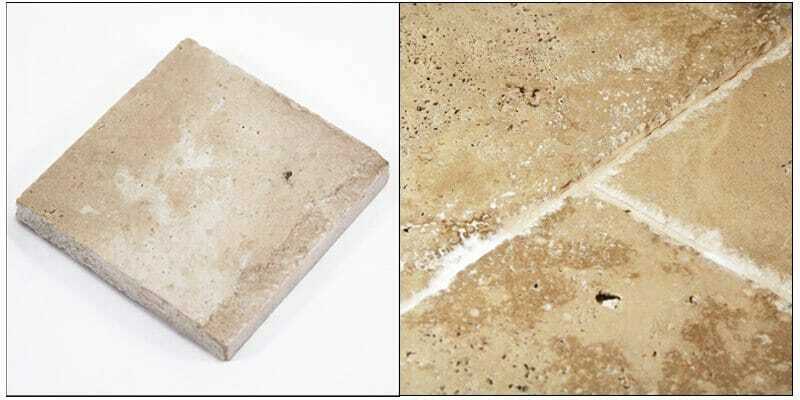 This gives the stone tile more texture and allows stone such as granite or sandstones to be used in applications such as bathrooms, kitchens, or pool decks and copings where slip hazards due to water may be a concern. The flaming process does not discolor the stone either. Virtually all stone can benefit from Stone Sealers. The sealer helps protect the stone from spills and abrasion and can some types can even help to improve traction on the surface. Keep in mind that a sealer is NOT an end-all solution to protecting your natural stone flooring and you should still clean up spills immediately and avoid using potentially damaging chemicals even on sealed stone. Sealers will help resist stains but they will not make your flooring impervious to them. Besides protecting your stone finish with a sealer, you can also use an enhancer to bring out the color and gloss of your stone tile. To put it in simple terms, Stone Enhancers soak into the pores of the stone and coats it, giving it a permanent wet look. 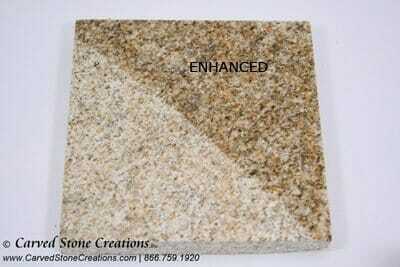 To see how a stone would look after an enhancer coat, simply wet the stone. Enhancers are especially helpful for bringing back the luster and color of a stone after it has been machined or given a weathering treatment like tumbling or flaming. Rather then just having your take our word for it, we’d like to show you some examples of stone with enhancer applied to it. We carry a variety of Stone Sealers and Stone Enhancers in our online store and we can help you chose the right one for your application. Looking for stone tile for your home? Carved Stone Creations offers a wide variety of stone tile in stock and available in our Kaukauna, WI showroom or through our Online Store. We have over 100,000 square feet of stone tile in stock! Our network of stone tile vendors can help us source nearly any type of stone or finish you desire. Don’t see the tile you are looking for in our online store? Contact us to see what we can source for you. Carved Stone Creations is located in Kaukauna, WI and we are a reasonable drive away from many Midwest metro areas including Milwaukee, Madison, Chicago, Indianapolis, Fort Wayne, Minneapolis, St. Paul, Grand Rapids, Ann Arbor, Traverse City, Davenport, Des Moines, St. Louis, Kansas City, Cincinnati, Columbus, etc. Visit our showroom to see first hand what we have in stock. We also provide natural stone fountains.